Refinancing can be a powerful financial tool for homeowners. Many people refinance their home in order to lower their monthly payments or to take advantage of lower interest rates. They might also refinance it to cash out on the equity to pay for home repairs or invest in a second property. As good as that all sounds, it doesn’t mean that refinancing is always right for every homeowner in every situation. It’s important to know what is involved with a refinancing deal and how it’s going to impact you financially. That’s why many people turn to a real estate lawyer when considering a refinancing deal. A lawyer can look over the proposal, help make you aware of costs and taxes that you may have overlooked, and help you determine whether or not the refinance is in your best interest. Sometimes, it’s not. When interest rates are higher. Interest rates are a major factor when it comes to determining your monthly payment. The higher the interest rate, the higher your repayment amount is going to be. Even a fraction of a percent can make a huge difference over the lifetime of your loan. If you were fortunate enough to lock in a low-interest rate with your original loan, it’s unlikely that you’ll benefit from a refinancing deal at a higher interest rate. When you’ll end up paying more than you save. Interest rates aren’t the only thing that can end up costing you more when you come to the table to sign on your loan. You’ll likely have closing costs, processing fees, and paying on points can make it expensive to refinance your home loan. In some cases, it can actually cost you more to refinance your home than you’ll save with lower payments. Make sure you know exactly what fees are involved in the process and weigh them against the potential savings. When you have to pay private mortgage insurance. When a home loan is close to the value of the home, a lot of lenders are going to require that you take out private mortgage insurance. This will be added to your total monthly payment. Private mortgage insurance gives the lender more incentive to give you a larger loan without a lot of equity in the home. It can balloon your monthly payment quickly and put it out of your budget. If refinancing your home is going to result in PMI, carefully consider if it’s worth it. When you can’t qualify for the new loan. Qualifying for a refinancing loan can be difficult. It could actually be more difficult to qualify for a refinancing deal than it was to qualify for the original loan. Lenders are going to be especially picky about your credit rating. Your credit rating may have dropped since you purchased your home, but even if it’s the same as it was, it might not be enough to qualify for the new loan. It’s important to shop around and make sure that you meet the minimum qualifications. If you don’t, then refinancing isn’t going to work for you. When you are close to paying off the home. Refinancing your home means you’ll be making payments on it for longer. If you are close to paying off your home, it might be worth it to just finish out the original loan. You can always take out a loan on your equity if you are in need of a cash infusion, and those loans typically have a much shorter repayment period. Do You Know if Refinancing Is Right For You? It can be difficult to sort through the terms of a refinancing deal to determine whether or not it’s the right move for you. That’s why it’s important to speak to a real estate lawyer before you sign anything. A lawyer can examine the document involved in the refinancing loan and make sure that the loan is in your best interest and make you aware of any potential pitfalls. 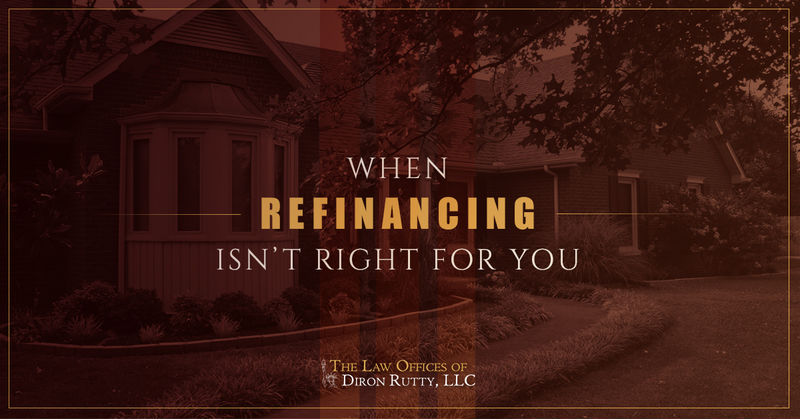 If you’d like to speak to a real estate lawyer about your financing deal, get in touch with the Law Offices of Diron Rutty, LLC today. You can give us a call or contact us through our website to schedule your free consultation today.